If you’re thinking of buying a premium high-performance sports-luxury coupe, then the chances are Mercedes Benz will be on the short list. 2018 offers buyers a face-lifted new S-Class Coupe that is offered in three forms depending on the powertrain of choice. From the outset the 2018 S-Class lines are so smooth and elegant, yet they never even hint of looking anything less than a full-blown, superbly styled, luxury-sports coupe. Having a facelift has given the Mercedes Benz S-Class Coupe some very nice new and subtle features. First of all the Mercedes Benz S560 Coupe has a brand new Diamonds grille, striking Intelligent headlight design, new OLED tail lights, a Lane tracking safety feature, new sports steering wheels with either leather or wood trim, a new COMAND entertainment system, elegant interior lighting with 64 ambient colours, an intelligent Smartphone integration and connectivity system, Smartphone wireless charging, new Mercedes Benz Apps, Apple CarPlay, Energizing Cabin comfort features, six new 19-or-20-inch alloy wheel designs, a new luxury black leather interior design, a new Porcelain and espresso brown leather interior design, four other interior designs (Benegal Red and Black being my favourite) and three new wood interior trims. All of this adds to the special S-Class Coupe experience, and you can’t help but feel spoilt. If the breath-taking style and panache of the Mercedes Benz S560 S-Class Coupe isn’t enough, then the AMG models do add more to the features mentioned afore on the S560. The AMG S-Class Coupe models have all of the S560 features as well as a new Panamerican Grille which is really bold and brazen. 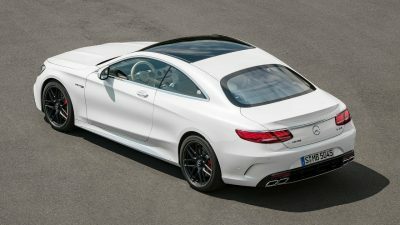 The 2018 S63 AMG Coupe has a unique mesh for the front air dam while the S65 AMG Coupe has it very own Black Jet Wing front air dam. There is no mistaking the true supercar performance now, and with the Swarovski Crystal head light feature on the S63 AMG or the Intelligent LED design which is found on the S65 AMG everyone will notice your arrival. A unique set of seven 20-inch Mercedes Benz AMG wheel designs are offered for either 2018 AMG S-Class Coupes. 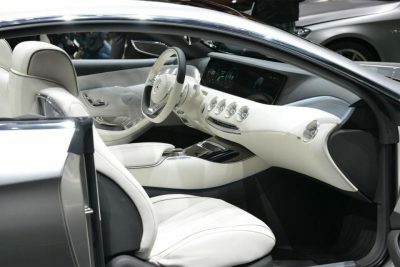 These Coupes come with two new unique steering wheel designs that are fully multifunctional and come with a choice of either Nappa Leather or Leather and Dinamica trim. The super high performance AMG braking systems use the latest brake calliper designs and even these come in a range of colours: silver, red or golden ceramic. An exclusive Night Package has the front air dam, wing mirrors and rear skid plate blacked out. The same exterior features can be styled in the AMG carbon fibre package. 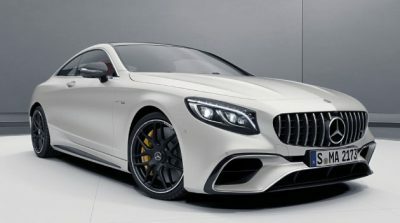 Opt for the 2018 Mercedes Benz S63 AMG Coupe and choose a very special AMG Performance Studio package which will have the Coupe dressed in a special matt black exterior paint job, a special Studio interior styling mix, a very bold and unique front air dam, yellow interior and exterior accents, an exclusive rear spoiler, and exclusive side graphics for the ultimate in coupe styling. The Mercedes Benz S63 AMG and the S65 AMG Coupes are both scintillatingly quick, while the S560 is no slouch at all – boasting 345 kW and a 0-100 km/h sprint time of 4.5 seconds. The difference between the S63 and S65 Coupes is that the engine in the S65 AMG is a V12 Bi-Turbo and the S65 is a tweaked V8 Bi-Turbo. The standard V8 Bi-Turbo motor is housed under the S560 Coupe bonnet. Beautifully settled on the road, the ride quality on an S-Class Coupe is second to none, while the effortless raw power is so addictive. Let Private Fleet help get you into one of these sleek beasts with some great financial options.